If there’s one thing that reminds me of my teenage years, it’s boy bands. I’m going to seriously age myself here, but back in the day I was in love with Hanson, Backstreet Boys, NSYNC, and 98º. I listened to their CDs on repeat. I bought magazines that came with posters, which I would hang on my closet door with scotch tape. I went to their concerts. I dreamed of someday running into them on the street, falling in love with one of them (the cutest one, obviously), and marrying him. As the boy-band scene faded, I grew up and forgot about those crushes. That is, until a few months ago. I was scrolling through my Instagram feed when I saw an advertisement that 98º was doing a Christmas tour and coming to my town. Cue insta-nostalgia and every 98º song stuck in my head. Immediately, I texted my Nick-Lachey-obsessed friend. We decided to not only get tickets, but also meet and greet passes. Carpe diem, right? 1999 vs. 2017. They’ve aged well, haven’t they?! On the day of the concert, we showed up with the rest of the 30-something-year-old crowd, but it was just like being a teenager again. There was the excitement as we drove by the tour buses on the way in. There was a brand new poster (which I may or may not tape on my closet door). Even after all these years, there were still the obsessed fans. One woman was wearing a sweater with snowmen on it, but on each snowman’s face she had attached a printed picture of one of the guys from 98º. Seriously. Meeting Nick, Drew, Jeff, and Justin (yes, we’re on a first-name basis now, y’all) was a blast. I was a little nervous that they would disappoint, mostly because I put them on a pretty high pedestal decades ago, but they were even nicer and more down-to-earth than I’d hoped. The concert itself was fantastic, too. The guys put on a great show with their old classics, new Christmas songs, and even a silly rendition of “Let it Go” from Frozen. My teenage crush was 100 percent renewed, and I loved every second of it. Basically, as corny as it is, I’m glad boy bands were around when I was a young adult. I’m out of touch with the current music scene, but I hope there’s a new crop of boy bands for teens today to listen to (and maybe meet on a reunion tour 10 or 20 years from now). What boy bands did/do you love? If you could go to a boy band reunion tour, which one would you choose? P.S. Love boy bands and YA books? (Of course you do!) Check out the Backstage Pass series from Entangled Teen! Each book focuses on a different member of a fictional boy band. Such fun reads! 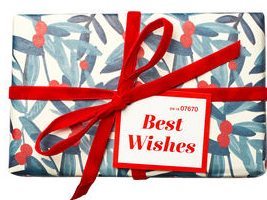 Give the Gift of …. The Sweethearts wish all of our readers a very happy holiday season! We hope you embrace the music, the decorations, the food, the fun, the time with family and friends, and of course … the gifts! For this month’s “Ask the Sweethearts,” we’re sharing our thoughts on the question: What holiday gifts do you recommend for someone who loves YA romance? Robin Constantine: I love giving (and receiving!) little luxuries — especially items for pampering! 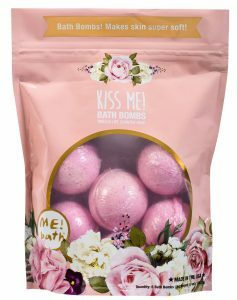 I love anything from LUSH — like this gift set — their bath bombs and bubble bars are decadent and leave you smelling great! Another great pampering item is a diffuser with essential oils like lavender to calm or citrus to keep your mind sharp and energized. Karole Cozzo: Here are mine! Laura Mercier Lip Glace in Babydoll: Makes lips soft and silky for kissing — this is a color everyone can rock and (bonus!) it tastes like birthday cake and marshmallows. LOVE candle lid magnet — This one won’t break the bank (think perfect stocking stuffer) and it makes candles every bit as pretty and romantic when they’re unlit as when they’re burning. Kiss Me! bath bombs — Because it’s hard to think of a better fragrance for relaxing in the tub with your favorite book boyfriend. Paperback book cover with bookmark — Protect the ones you love the most — available in a myriad of patterns for 10$ a pop. Stephanie Scott: My gift recommendations are my two favorite contemporary young adult romances from 2017: WHEN DIMPLE MET RISHI by Sandhya Menon and I BELIEVE IN A THING CALLED LOVE by Maurene Goo. 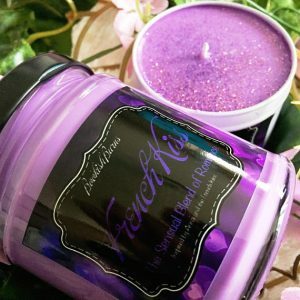 You might want to pair these books with bookish candles from Novelly Yours, a reader-turned-candle-seller with scents like Currently Reading, Book Boyfriend, Romance Trope, and scents named after various book fandoms. Amazon Gift Card: Picking out a book to give someone else is tough. What if they already read it? What if they’re not interested in it? Save the stress. Go for the gift card! 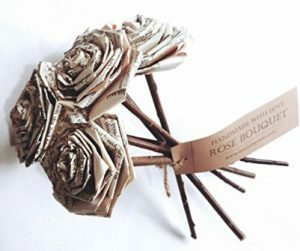 My favorite is this one in the shape of a bookmark. 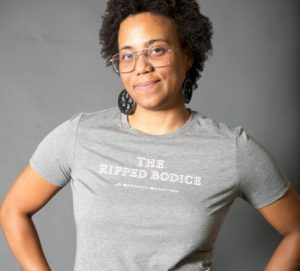 Linda Budzinski: Well, obviously, the perfect gift is a Sweetheart book, along with some swag from the Ripped Bodice, the only book store in the United States devoted exclusively to romance. I especially love their “Smart Girls Read Romance” t-shirt (I wear mine all the time!) and their “I am the heroine of my own story” tank top. In this season of thanksgiving and good cheer, we Sweethearts find ourselves counting our many blessings. Before we share the things we are most thankful for, a note of congratulations to Megan, the randomly selected winner of our November prize, a winter comfort pack including THE PROMISE OF AMAZING by Robin Constantine! Linda Budzinski: I start off every day, during my morning walk, thanking God for my blessings, and it is a long, long. long list. For this post, I’ll stick to one particular blessing: my church. I am thankful for our pastor, who never fails to help me see a Bible passage in a new light; for our many missions projects, which serve so many in need in our community; for our prayer chain, which has kept my family in their prayers during some difficult times; for the kids our youth group, whose energy and humor keep me young; and most of all for my many friends within the congregation, who constantly teach me what it means to show God’s love in a world that truly needs it. Stephanie Scott: This year, my husband and I said goodbye to our kitty of 11 years. Knowing our cat was sick gave us a timeline and a chance to prepare. There’s nothing quite like losing a pet. It’s not the same as losing a person, but in a lot of ways, the loss is similar. I’m thankful we were able to provide a home to our rescue cat for over 10 years, giving him good care. Now, we have two farm kittens tearing our house apart. They are spastic and constantly in need of snuggles. I’m thankful for our fuzzy pals, who bring needed joy and laughter into our lives. Darcy Woods: I’m not sure how to narrow a list that feels infinite, but here goes! My heart bursts with gratitude and love for my husband — a consummate believer in every zany idea I’ve ever conjured, not to mention an extraordinary barista (with an unofficial PhD in pumpkin spiceology). I can’t fathom having a better co-pilot in this life adventure. I’m thankful for my family — both two- and four-legged — and my friends, who are truly my emotional Spanx. They have also been known to make me laugh to the brink of peeing my pants. And under the category of “things” I’m grateful for: fuzzy socks, Glazed and Confused doughnuts, books (glorious books and all those who love them!!!) sparkly things, ModCloth, music and art in all forms, unicorns, the cosmos, blanket forts, and everything in this world that steals my breath and gives it back…to name just a few. Robin Constantine: I’m so thankful for my readers! Whether it’s an email, a tweet or an Insta post, I’m so grateful that someone would take the time and effort to mention that they enjoyed my work. It never fails to bring a smile to my face and has gotten me through some creative rough patches! YA readers are THE BEST! Erin Fletcher: The thing I’m most thankful for is my family. I am blessed to have amazing parents, grandparents, aunts, uncles, cousins, and an amazing brother. I also have three godchildren who are the cutest kids on the planet (not that I’m biased or anything). My family can be loud and crazy, but they never fail to make me laugh. For example, my 80-something-year-old grandma recently informed me that she learned how to use Siri, and the first question she asked was, “How many of the Kardashians are pregnant?” Yep. In addition to making me laugh, my family is always there for each other, like the time my parents drove 12 hours through the night to get to North Carolina when I was in the hospital. There’s no way I would be who I am without my family, and I am incredibly grateful for them. Happy Thanksgiving! 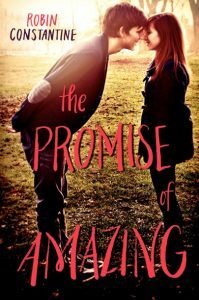 This month Sweetheart Robin Constantine is offering up a veritable feast of a prize: a signed copy of her New Jersey romance, THE PROMISE OF AMAZING, along with a winter reading survival kit filled with some of her favorite comfort items! The Camelot Thanksgiving buffet ran smoothly. I kept looking for warning signs of Brooke’s ominous words that it was a sinking ship. All I saw was the Caswell clan working together — well, I was working; Brooke spent a lot of time reconnecting with Eben while Josh, still green from his Thanksgiving Eve bender with his home-from-college buds, tried his best not to puke in the mashed potatoes. Everyone, even my dad, who rolled up his Brooks Brothers sleeves to help plate the sides for the buffet table, was happy, buzzing , joking. No doom and gloom. Nothing out of place to make me think we were in any sort of trouble. Brooke had to be wrong. Being busy made the afternoon go quickly, and soon enough, the five of us were alone and gathered around a table in the empty banquet hall, a little tired but full of the meal Chef Hank had prepared for us. “Aw, shucks, Mom, any time you want me to quit school and be your permanent child, say the word, I’m all over it,” Josh said, grinning. “Please no, I’m finally getting some much needed peace,” my father kidded. “Hey, look what the wind blew in,” my mother said, raising her glass toward the door. I turned to see a rather disheveled Pete, as if he’d literally been windblown, walking toward our table. Brooke got up and threw her arms around him. My stomach lurched. Pete shrugged off his coat and hooked it over a chair at the adjacent table. “Hey, Wren,” he said, smoothing down his hair and taking the seat across from me. With his dark, unruly curls and green eyes, Pete was exceptionally handsome, but he was so goofy once you got to know him that his good looks became less intimidating. I wondered if he knew that I knew he’d knocked up my sister. One thing was for sure: Between Brooke and Pete, this kid was going to be drop-dead gorgeous. “How was your Thanksgiving? Your parents must have been thrilled you made it home,” my mother said, beaming. Pete chuckled, but it was guarded. He folded his hands and glanced at Brooke. And then the world moved frame by frame. I could feel the tremor of what was about to happen but was powerless to act on it. Please, please, Brooke, not now. A waiter came by and dropped off a carafe of coffee for my father. Mom sat in suspended animation, waiting to hear about Pete’s Thanksgiving. Josh had nodded off, a shock of dirty blond hair partially hiding his eyes. I pinched his leg and he jerked awake. “We’re pregnant!” Brooke blurted out, grabbing Pete’s hand. Leave a comment sharing one thing you are thankful for. Tweet a link to this post; be sure to use the the #SweetheartsofYA hashtag. Contest ends at noon on November 29; we’ll choose a random entry (U.S. only) and announce the winner on November 30. 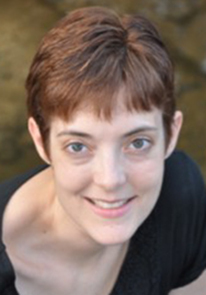 This month we welcome Kendra Highley, author of six young adult romance novels, all published by Entangled Teen/Entangled Teen Crush. Her most recent release, THE PERFECTLY IMPERFECT MATCH, is the third in her Suttonville Sentinels series and is about an unlikely romance between a star high school athlete and a “needlepoint ninja.” It reportedly includes a skinny-dipping scene, so obviously you need to check it out ASAP! Welcome, Kendra! Tell us about your books! I write YA contemporary romance primarily, with a few SciFi/Fantasy titles for variety. I have a two-book series, Finding Perfect and Defying Gravity, which is about finding out who you really want to be, and who you really want to be with. I also have a three-book series, The Bad Boy Bargain, Swinging at Love, and The Perfectly Imperfect Match, which is about baseball players, each dealing with their own problems, and the girls who drop into their lives and turn everything upside down. 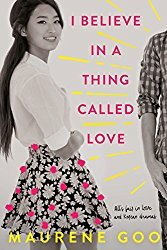 What do you like most about writing contemporary YA romance? The Feels ™ I spend a lot of time with teens. I have two of my own, and I’m currently on a motor coach with about 50 high school marching band students (my kids included). I see firsthand how everything is so new. The feelings are giant, life-changing things. Adults sometimes forget that, but I enjoy trying to capture that magic (and heartbreak) and showing it honestly. Love it! And love your little trademark, hahaha! If you could pick just one of your books to be made into a movie, which one would you pick, and why? I’m thinking Finding Perfect would make an adorable movie for Disney Channel or Nickelodeon Teen. It’s sweet, and deals with how perfectionism can paralyze you. It’s also a “Can’t Buy Me Love” story, in which Paige, in return for math tutoring, fixes Ben up into someone her best friend might like. What’s the best book you’ve read so far in 2017? I absolutely loved Strange the Dreamer by Laini Taylor. Honestly, I’d read a cereal box if she wrote it. She has such a way with words and world-building. This time of year, I’m a total marching band mom. My kids are in a large, elite program, and traveling the competition circuit with them is amazing. They are such a talented group and it’s fun to see what the other programs come up with. This ain’t your mama’s marching band … these kids dance, play complicated classical music, and push props around. It’s like Broadway and a traditional marching band had a baby. How fun! Okay, on to the lightning round! Summer vs. winter: Winter, except Dallas doesn’t really have winter. It has HOT and not hot. Date night out vs. girls’ night out: Date night out. Chocolate vs. vanilla: Chocolate is literally life. Cats vs. dogs: Cats … my four little monsters demanded I tell you that. Ocean vs. mountains: Mountains. I like a good beach, but Sedona is magical. Kendra C. Highley lives in north Texas with her husband and two children. She also serves as staff to four self-important and high-powered cats. This, according to the cats, is her most critical job. She believes in everyday magic, extraordinary love stories, and the restorative powers of dark chocolate.